European corn borer (ECB) catches remain too low to register a map image. This flight has been extremely low and very spotty. 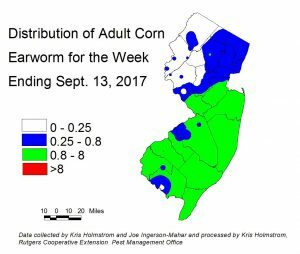 ECB feeding in NJ sweet corn plantings is nearly non-existent now. What remains has been overshadowed by fall armyworm (FAW) feeding. Check 5 plants each in 10 random locations for a 50 plant sample. Look for “shot-hole” injury, and consider treating when the number of infested (from ECB or FAW) plants in a 50 plant sample exceeds 12%. 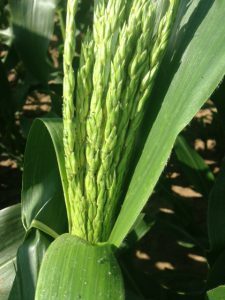 Once plants hit full tassel, ECB larvae will move downward on the stalk and re-enter the plant near the area where ears are forming. This can result in direct injury to the ear. 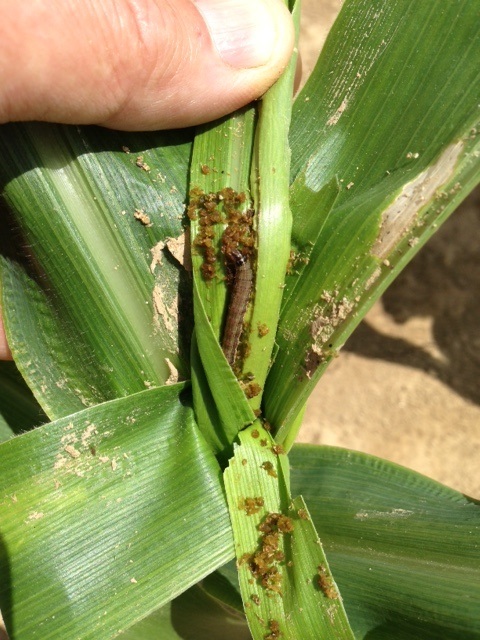 For growers who still have corn that has yet to silk, consider an insecticide application at the full tassel stage to target ECB larvae as they migrate downward. This application can eliminate larvae that have escaped any earlier insecticide applications. Corn earworm (CEW) moth populations increased late last week with the onset of low pressure (see CEW map at left). Since then, moth catches have subsided some, but the weekly average remains higher. A few pheromone traps in southern NJ, and particularly in Cape May county registered very high catches through the latter half of the previous week. This too has now subsided, but this population remains a threat to all silking corn plantings, and numbers may increase with rising nighttime temperatures. In this map, areas in green roughly correspond to a 3-4 day schedule, while blue areas are 4-5 days. White “holes” on the map represent traps that caught few or no CEW moths. These are outliers, and the broader color scheme in any particular region is more representative of the population. Be aware that synthetic pyrethroids have become less effective at managing ear infestations from this pest over the past several years. For this reason, it is advisable to include products in the IRAC group 28 (Coragen, Besiege) or IRAC group 5 (Radiant, Entrust (OMRI approved)). It is important to note that sweet corn varieties containing Cry 1a proteins for caterpillar resistance (Attribute I types) are no longer providing adequate control of CEW. A trial at the Snyder Research and Extension Farm in Hunterdon County two weeks ago returned the following levels of ear infestation from CEW: Non-B.t. – 62%, Attribute I – 47%, and Attribute II – 2%. CEW pressure during this study was low to moderate. The same study, conducted at RAREC in Cumberland County and harvest this week returned the following CEW infestation rates: Non-B.t. – 96%, Attribute I – 100%, and Attribute II – 0%. CEW pressure during this study was moderately high. These studies indicate that Attribute I varieties should be treated for CEW following the recommended silk spray schedules for non-B.t. varieties. Southern NJ CEW pheromone trap catches increased through the latter half of last week, and have dropped off with cooler nights this week. However some catches were, on average, quite high and this is reflected in this weeks’ map (see CEW pheromone map below at right). The Green Creek trap on the Cape May peninsula registered very high nightly numbers (218/night) through late last week. This likely represented moths arriving on southerly breezes in advance of last weeks frontal system. There are relatively few pheromone traps deployed compared to the number of blacklight traps in the state, resulting in much broader color bands on the pheromone map. Generally, the green portion of the map represents a 3-4 day schedule, while areas in red should adhere to a 3 day schedule. Fall armyworm (FAW) infestations continue, but we are not seeing the higher levels we typically expect at this time of year. 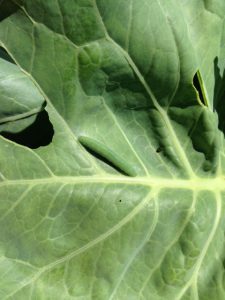 Larval populations are being managed effectively with appropriate insecticides when the infestations are identified promptly. We should be watchful for increases should we get any tropical weather systems over our area. This pest favors smaller whorl stage plants, and will even infest seedling stage plants if the population is high. FAW is capable of serious injury to plants, and scouting should commence immediately on whorl corn throughout the southern half of the state. Look for plants with “window-pane” type feeding that leads from the outer leaf surface down into the whorl (see photo at left). As larvae grow, this damage will progress to obvious ragged holes, with lots of caterpillar droppings in the whorl. The larvae are tan and brown (see photo at right), with a conspicuous upside down “Y” on the head capsule. If FAW alone or in combination with ECB are found to infest 12% or more plants in the sample, consider an insecticide treatment. FAW do not respond well to synthetic pyrethroid insecticides. In general, IRAC Group 5 materials like Radiant or Entrust (OMRI approved) or IRAC Group 28 materials like Coragen (or those that contain Coragen as a component) work very well on FAW and other caterpillar pests. Many sweet corn plantings now in the pre-tassel stage have developed populations of the corn leaf aphid (see photo at right). These aphids are not adequately controlled by pyrethroid insecticides and if not managed properly, will end up on the ears. If these aphids are detected in tassels, it is advisable to target them specifically with the first 1-2 silk applications. Lannate has generally been good in the past, although acetamiprid (Assail) is also labeled for aphid management in sweet corn. Assail will not control caterpillar pests, and must be applied in addition to the preferred caterpillar material. Rust is occurring with increasing frequency and severity in sweet corn plantings at this time (see photo at left). Our extremely wet summer is contributing to the difficult nature of this disease. Cooler nights with longer dew periods will also result in heavier rust infections. Sweet corn should be scouted for this disease along with insect pests. 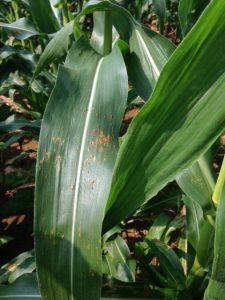 If rust is found on whorl or younger stage sweet corn, there is a good chance it will negatively impact yield or ear quality. Check your seed source for information on the relative susceptibility of your corn varieties to this disease. If rust is occurring on plants prior to the tassel stage, fungicide applications may be warranted. See the Sweet Corn section of the Commercial Vegetable Recommendations for useful fungicides. We have had an explosion of pepper weevil catches with new locations in the Berlin area, Salem County and Swedesboro area as well as continuing to catch individuals around Hammonton. Fortunately, it is late season now, and these infestations will cause minimal crop loss. Late season weed growth in fields will diminish the value of insecticide treatments for weevil at this time. It is likely that the initial infestation discovered in a Hammonton field was the result of an introduction of weevils sometime in mid-to late July. This population easily spread naturally to adjacent fields and were likely transported to more distant sites. The movement of equipment, bins, and vehicles between farms or processors facilitates the spread of weevils. 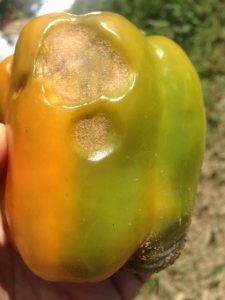 More fields are showing signs of pepper anthracnose fruit rot infections. This fungal disease causes depressions on the fruit surface, with pinkish spores developing soon after (see photo at right). Heavy rains can cause this disease to spread rapidly throughout a field, and infected fruit should be removed from the area during harvests. Appropriate fungicides to manage this disease in addition to fruit removal may be found in the Pepper section of the 2016-17 Commercial Vegetable Production Guide. This is the time of year when melon aphid populations continue to appear in more pumpkin and winter squash fields. 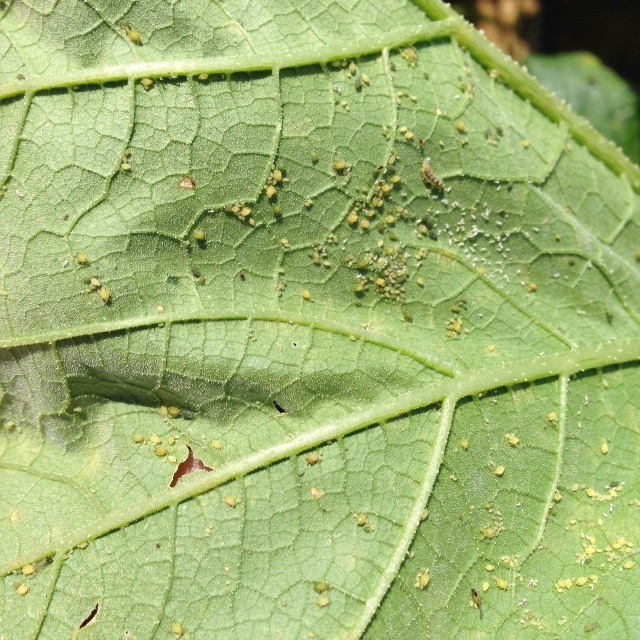 These aphids can build to extremely high levels in fields (see photo at left), resulting in sticky droppings accumulating on the surface of maturing fruit. If they are discovered in more than two sites in a 10 site sample, consider an application specifically to manage them. Useful materials include Fulfill and Assail, but a full list of recommended products may be found in the Pumpkin and Winter squash section Commercial Vegetable Recommendations. Cucurbit downy mildew (CDM) remains active on cucumber in NJ. While no other cucurbit crops have been reported to be infected in NJ, cantaloupe infections have been reported in New York and giant pumpkin and butternut squash infections have been Reported in Sussex County, Delaware and Lancaster County PA. It is important for all cucurbit growers to check the below website at least weekly for updates on the movements of CDM in the eastern U.S. (http://cdm.ipmpipe.org/). With CDM on giant pumpkin just to our west, it is advisable that pumpkin growers add CDM specific materials to their fungicide rotations. ALL cucurbit crops should be scouted for the presence of CDM. 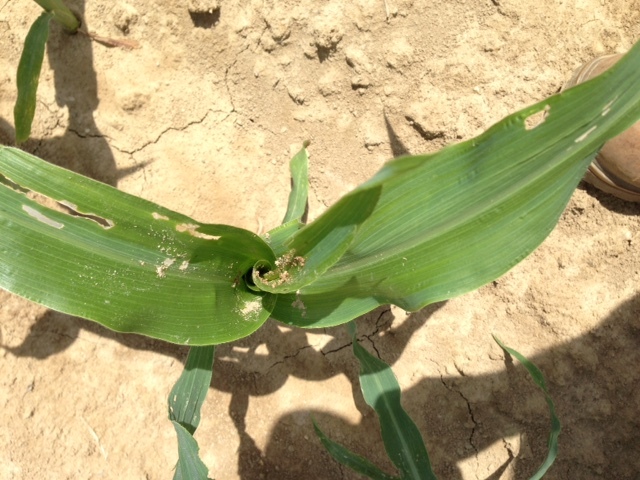 CDM causes yellow lesions to develop on the upper leaf surface. Lesions are confined within veins initially, but coalesce quickly to kill the entire leaf when moist conditions prevail. Beneath these lesions (lower leaf surface), dark gray spores will be produced. If discovered, please report any incidence of CDM to your county agent as soon as possible. It is useful to note that CDM is strictly a foliar disease, and if individual fields are to be harvested within 1-2 weeks, there is diminished value to the addition of systemic fungicides targeting CDM. As we get into the latter part of the growing season, caterpillar pest can become an increasing threat to tomatoes. 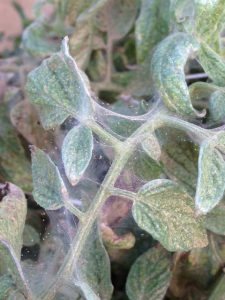 Typically corn earworm (on tomatoes – tomato fruitworm) is the main threat. Moths lay eggs near upper flower clusters, and the larvae penetrate the shoulders of fruit near the top of the plants. CEW does not feed on foliage, and damage is often first discovered by harvesting crews. With less corn now available for CEW, it is wise to monitor fields weekl y for signs of increased fruit injury. While scouting 5 consecutive plants each in 10 field locations, note the presence of fresh fruit injury/live larvae. Should this occur in 2 or more sites within the field, consider an insecticide application to limit further injury. Products in the IRAC group 28 (Coragen, Exirel) or IRAC group 5 (Radiant, Entrust (OMRI approved)), are effective. 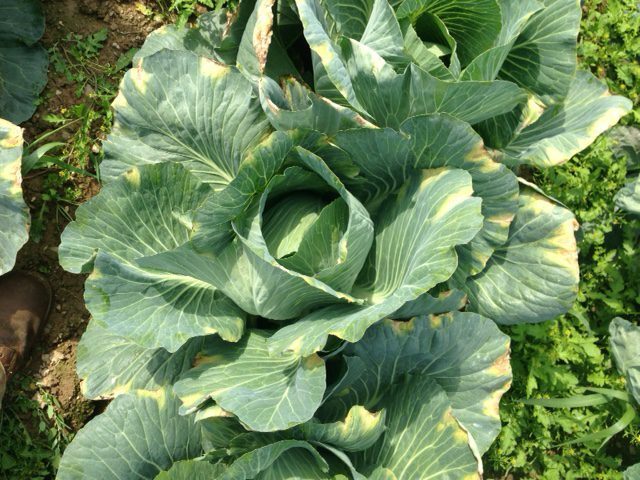 Note that Coragen may also be used via drip irrigation. 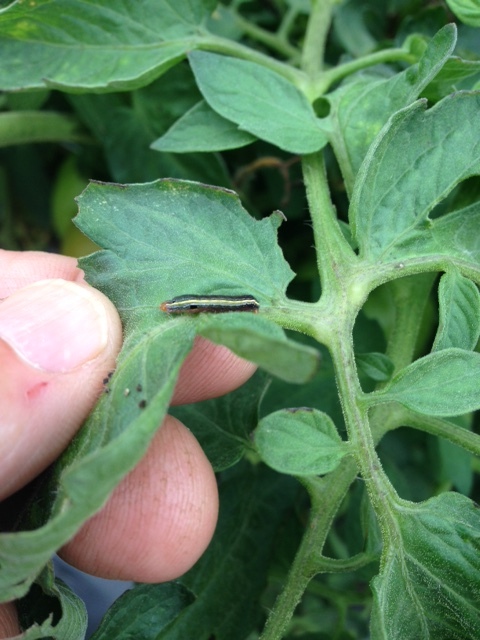 Another, less frequent pest that continues to appear in a number of locations is the yellow-striped armyworm (YSAW). This brightly colored caterpillar (see photo at right) does feed on foliage prior to entering fruit, and it’s presence may be detected by foliar injury on outer canopy leaves. The same insecticide selections are useful for this and other armyworm pests. Two-spotted spider mites are also active in many tomato plantings. These pests, if not controlled, cause foliage to dry out as they feed. Check 10 sites in the field and look for whitish pin-spots (stipple) on the upper surface of leaves. 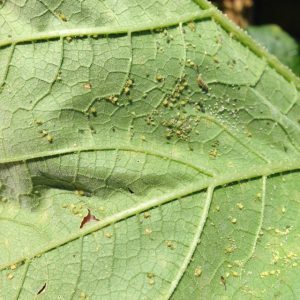 Mites will be found on the undersides of these leaves. As populations increase, leaves will turn yellow, and finally brown and dry. Heavier mite populations will produce webbing on and between leaflets (see photo at right). It is often useful to treat mites when first discovered to prevent a more difficult population from developing. 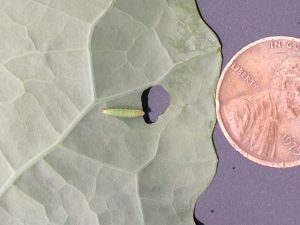 Late summer cole crop plantings are experiencing infestations, primarily from imported cabbageworm (ICW) (photo at left) and diamondback moth (DBM) larvae (photo at lower right). While both are damaging to these crops, DBM is more difficult to manage, as it is quite resistant to synthetic pyrethroid insecticides. DBM is effectively managed (along with all other caterpillar pests) with insecticides in the IRAC class 5 (Radiant, Entrust (OMRI approved)), and class 28 (Coragen, Exirel). DBM larvae are very small and are tapered toward both ends. They thrash violently when disturbed. ICW larvae grow larger and have a covering of velvety hairs as they grow. Check 5 consecutive plants each in 10 random sites within the planting. Consider treating if 10% or more leafy cole crops are infested at any stage, or in heading types in the 0-9 true leaf stage. In heading types from 9 leaf to early head, a level of 20% plants infested may be acceptable. As heads form, the threshold should drop to 5% plants infested with any larvae, to protect the marketable portion of the plant. Black rot, a bacterial infection of cole crops is active on many plantings at this time. Black rot infections typically occur on mature foliage, initially resulting in yellow triangular lesions at the leaf margins (see photo at left). Lesions progress inward on leaves, and in some types (collards, kale, and some very susceptible yellow cauliflower varieties) can be economically destructive. Heat treatment of seeds is useful for limiting seed borne infections, but proper rotation is a must as well because the bacteria will persist on undecomposed host debris. Once an infection appears, copper sprays can help limit spread. Field workers should also avoid fields when foliage is wet.